Why do most of the references to the movie ever made appear to be either comedy skits or direct quotations of the elevator scene? There must be a perfectly valid reason for that, which, I imagine, is somehow connected with the goal of the ultimate silliness that both the script and the actors pursue and almost reach despite the hindrance of the incessant ominous soundtrack. [First viewing] I found it really hard to judge this movie purely on it's own merits. The tension is lessened and horrifying moments lose some their punch when you've seen them all played out and mimicked elsewhere. The direction and camera work is still amazing. The incoherence of the plot is perfectly mimicked in the mounting irrationality of Nicholson's performance. Although the experience and emotional punch was lessened, I was intrigued enough to go down the rabbit hole of analysis after. The Shining is perfect in so many ways. The story is engrossing. The horror doesn't overdo itself. The acting is fantastic. 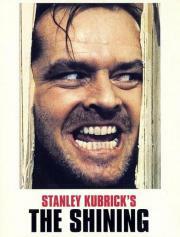 The way that Nicholson turns from mild mannered writer to psychopath is perfectly paced. The few supporting characters help to round out the story with their own merits; Scatman Crothers does a fantastic job as the cook who also has the shining. The music is one of the best characters in this film. It holds your hand as it takes you along for this amazing story. Probably the weakest Kubrick to me. While Nicholson's performance is brilliant, its quirks are given too much importance. His psychological portrait is not drawn enough and does not progress smoothly enough, so that we're left completely passive in front of it, waiting for the next deterioration without having any kind of intuition/explanation for it. Even more so as Danny's powers are never explored.